Election Day is almost upon us here in the U.S., as huge numbers will rock the vote on November 6. It has been a heated election season, and it seems that Barack Obama and Mitt Romney are in a close race — in fact, both have been cited as poll leaders in various swing states (depending on where you get your news). The Caucus, The New York Times — Not into partisan Tweeting? NYT reporters are covering both campaign trails. Josh Marshall, Talking Points Memo — Not your run-of-the-mill political news, opinion and analysis. Think "election reporting — with doses of snark and wit"
Anthony De Rosa, Reuters — The social media editor and Tech Tonic host is a heavy Tweeter who rocked the live analysis of the debates. Fans await his Twitterage for tomorrow's election results. 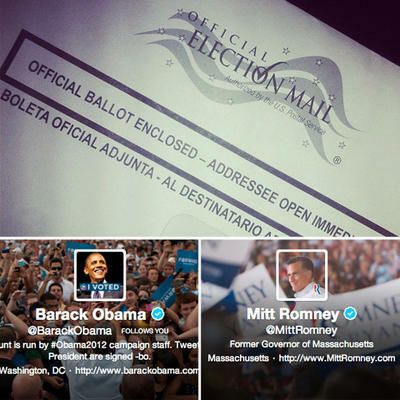 Are you following the election? Is it shaking out the way you expected? Let us know in the comments.